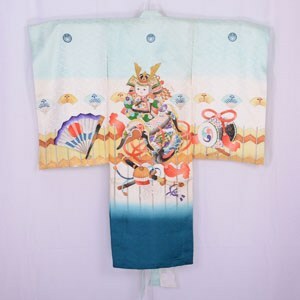 This beautiful vintage Japanese boy's formal kimono is a miyamairi kimono traditionally worn on a boy's first visit to a shrine. The kimono is not worn but is wrapped around the baby and the straps attached to the front lapels draped around the mother's neck. The gown is big enough to be worn by an older child (possibly age up to 4-5 years). The gown is in excellent condition and would make a stunning wall hanging. The family crest that appears is maru-ni sagari fuji (wisteria).